Take 1 Black-Cap in the morning and 1 Black-Cap in the afternoon. This is an ultra concentrated formula of extreme potency. NEVER EXCEED 1 BLACK-CAP PER SERVING. NEVER TAKE MORE THAN 2 SERVINGS IN A 24-HOUR PERIOD. 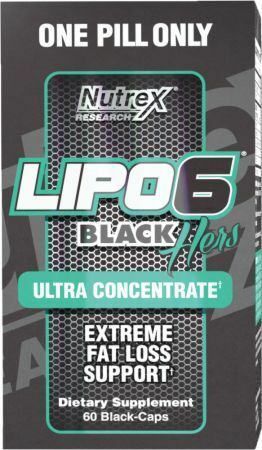 For maximum results consume LIPO-6 Black Hers Ultra Concentrate at least 30 minutes prior to a meal. Do not take within 6 hours of sleep. Regular exercise and proper nutrition are essential for achieving your weight-loss goals. As individuals vary so may results from using this product. This product utilizes a combination of synthetic and natural compounds. 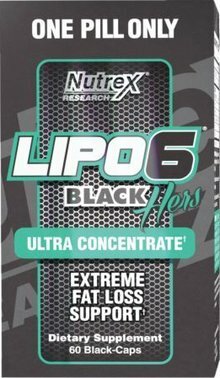 IMPORTANT MUST READ: LIPO-6 BLACK HERS Ultra Concentrate is absolutely not for use by persons under the age of 18 or those sensitive to caffeine. Do not use if pregnant or nursing. Each serving of this product contains 200mg of caffeine, about as much as 1-2 cups of coffee. Monitor other sources of caffeine such as medications, foods or beverages while taking this product. Do not consume yohimbe, synephrine or thyroid-boosting compounds from other sources, including but not limited to other dietary supplements or medications containing phenylephrine or any stimulants whatsoever. Do not exceed the recommended serving. Do not use in combination with alcohol. Do not use this product for longer than 60 days. Follow with a 15 day break. Consult your physician prior to use if you are taking medication, including but not limited to, MAOI inhibitors, anti-depressants, aspirin, non-steroidal anti-inflammatory drugs or products containing phenylephrine, ephedrine, pseudoephedrine, phenylethylamine or other stimulants. Consult your physician prior to use if you have a medical condition, including but not limited to, heart, liver, kidney or thyroid disease, psychiatric disorders, difficulty urinating, diabetes, high blood pressure, cardiac arrhythmia, recurrent headaches, enlarged prostate or glaucoma. Discontinue use 2 weeks prior to surgery. Immediately discontinue if you experience rapid heartbeat, dizziness, severe headaches or shortness of breath. This product contains ingredients that may be banned by some sports organizations. KEEP OUT OF REACH OF CHILDREN.